Generally speaking, the European settlers in North America coined the phrase 'Indian' or 'Red Indian' to describe the North American tribes they found while they were settling what is now the USA. To the north of this vast collection of varying regions and climates were the native settlements of what is now Canada, while to the south were the various peoples of modern Mexico, most especially the Aztecs. The Chickahominy were located on the eastern seaboard in what is now the states of Delaware and Maryland (eastern section). They were neighboured by the Pamunkey to the north, the Piankatank and Werowocomoco to the east, the Weanoc and Paspahegh to the south, and the Powhatan (proper) and Arrohattec to the west. The Chickahominy name is shown in a variety of ways in original records, including Chickahominie or Chickahamanias. The tribe occupied both sides of the Chickahominy River, from the mouth of the White Oak Swamp, where the waters rise. 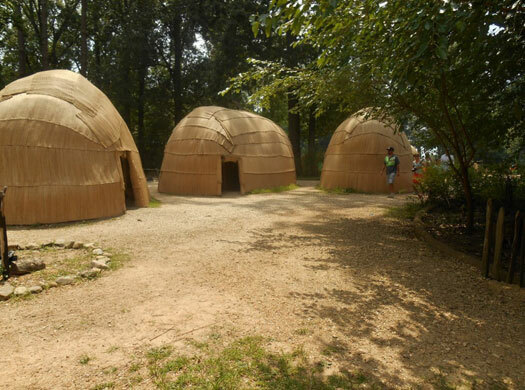 They lived in what apparently was the most populated area of the Powhatan lands, although they refused to be bullied by the great Chief Powhatan himself. There are a few other points of distinction when comparing to the main body of the Powhatan. For example, the fact that several Pamunkey native tribal names were unknown amongst the Chickahominy. There is also some evidence to suggest that the Chickahominy were about the most conservative of the local tribes. The sub-rulers or sub-kings of the Powhatan confederacy of the Virginia coast and Chesapeake Bay region were known as weroances (the plural form, or weroance, singular), an Algonquian word meaning leader or commander. Operating under the authority of a paramount chief called Powhatan, a weroansqua was the female equivalent. Spellings of both titles vary greatly thanks to the lack of standardised spelling of the time. Each tribe of the Powhatan confederacy was led by its own weroance, and like any titled lord in Europe's nobility he would carry the tribe's name as his title. Pochins, weroance of the Kecoughtan, would be referred to as Weroance Kecoughtan, or simply 'Kecoughtan' (the Chickahominy did things a little differently, as shown below). Most foreign writers who came across a weroance did so only on a special occasion, because a foreigner's presence was special, as would be any notable visitor from outside the tribe. However, John Smith noted that there were few differences between weroances and their subjects. The Chickahominy are a powerful tribe and, as such, do not take kindly to Wahunsenacawh's high-handed attitude. They never fully assimilate within his confederacy. They also refuse to allow him to choose their weroances. Smith relates that the Chickahominy are governed by a group of priests and eight elders, known as mungai. Their title for their head-man is mangoap - possibly meaning 'great man' - as opposed to the Powhatan term 'weroance', probably meaning 'he is rich'. As Mooney puts it: 'The powerful Chickahominy however, although accepting him [Powhatan] as overlord maintained their own home rule, and took an opportunity to put themselves under the protection of the English'. Strachey points out that the Chickahominy are so alien from being Powhatan's subjects that they have been thought of as his enemies. Mangoap (?) of the Chickahominy. Attossomunch is the war chief of the Chickahominy, one of the strongest tribes in the Powhatan confederacy. Although confirmed as a 'war chief' his position as mangoap is not confirmed, even though certainly does govern through a peace chief and a council of elders. Attossomunch achieves fame through the prowess he displays in the war against the Monacan during his lifetime. He and his personal warriors are the foundation of a group known as the 'Cult of the Tomahawk', of which Attossomunch is the leader. By this time, three distinctive native tribes of the Eastern Woodland dominate the territory now known as Virginia. These tribes speak three different languages - Algonquian, Siouan and Iroquoian - and live in organised villages along the banks of the coastal waterways, in woodlands and mountain valleys. 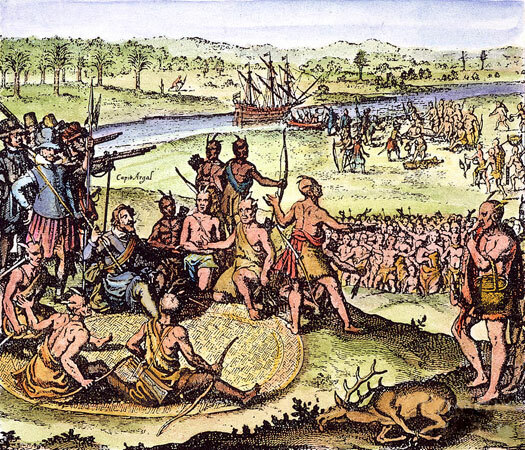 When Europeans begin arriving in the region, they meet Indian people of the coastal plain which is inhabited by an Algonquin empire, today collectively known as Powhatan. The south-western coastal plain is occupied by Iroquois, Nottoway, and Meherrin. The Chickahominy and Eastern Chickahominy occupy the Chickahominy River in New Kent County. The Piedmont is home to two Sioux confederacies: the Monacan and the Manahoac. In 1611, the war is given a dramatic push through some perceived disrespect shown to Governor Dale by Powhatan. George Percy is despatched to wreak revenge on the Paspahegh and their neighbours, the Chickahominy, as they are settled in closest proximity to Jamestown. Percy's men kill fifteen or sixteen tribesmen and capture the Paspahegh queen (Wowinchopunk's wife) and her children. The children are thrown into the river and are shot, whilst the queen is taken away and stabbed to death despite the desire of some who wish her to be burned instead. Chief ruler of the Chickahominy. Many former member tribes of the Powhatan confederacy are extinct by 1722, having drifted away or merged with other remnant groups. The Rappahannock had already lost their reservation shortly after 1700, while the Chickahominy had lost theirs in 1718. These groups and the Nansemond fade from public view in the USA. Only the Pamunkey, Mattaponi, and an Eastern Shore group keep reservations, although their land constantly shrinks in size.